Get a domain and hosting if you’re using WooCommerce or point your domain to your shopify store. Get yourself a subscription of the popular dropshipping service providers like Alidropship, Oberlo, Spocket and such; these are the big players. Select the products from the dropshipping service providers and populate them on your online store. Conduct internet marketing activities like paid advertisements, organic marketing practices, email marketing or others. Get the visitors of your site to buy the products you have listed and transfer the order to the manufacturer or supplier through the dropshipping service engine. Pay the supplier to ship the product to the address of the buyer and make sure that product reaches, and for your added promotion, request for a product and service review. This is basically your preference. If you want to set-up your business quickly or get started within a week, you can start with WordPress and install WooCommerce. With WordPress you probably pay for a premium theme, some plugins to add functionalities, get a domain and hosting plan and if you don’t go for a DIY way, you’ll also pay the developer. Now, if you want to start your business really quickly, like within days, you can start with Shopify. The process for shopify is almost the same except that instead of selecting hosting and paying for it, you’ll pay for the different premium Shopify plans. What is there to optimize? Your site be welcoming to the visitors, the speed of your site, the looks of your site and how well your site represents the products you’re trying to sell. It is also a common practice that many dropshippers start a new site completely dedicated to a single product that pays high commission rate. The dropshipping services platforms like Alidropship, Oberlo and Spocket bridge the gap of product selection and order processing between the suppliers and the sellers. The suppliers associate themselves with these dropshipping service platforms and list their products and offers there. When you select your dropshipping service platform, you need to be careful about the quality of service, such as how often the product quantity are changed, are the orders created in your site reaching the supplier, and more importantly are those orders being delivered to your buyer in time. One of the reliable ways to check is to look out for the reviews of these service providers. But, there’s something more important when you’re running a dropshipping business. Do you have enough options to select the products that you want to sell? Are the suppliers listed have a worldwide shipping activity active? How long do they take to deliver the products/parcels of different size? Can you find the list of suppliers verified by the dropshipping service provider? Do the suppliers accept the order of fulfilling unbranded or custom branded packages? And more importantly, how are the reviews, both technically and supplier based? Take this as the backbone of your business. If you have a winning product, make sure to maintain a cordial relationship with the supplier. Try customizing your products, if possible and even try out custom branding or listing those on Google Shopping & Amazon by registering a brand. And the main thing when you are working on a business backed up by technology is – try them all out. Don’t miss to use Spocket especially if you want products manufactured or supplied from USA or UK. How to select products for dropshipping business? This is a point where even books with a thousand pages couldn’t probably provide a full proof idea. However, we’ll include some of the basic tips and some latest dropshipping trends. But please remember that the best product to sell is the product that you have enough information about. Learning about a new product to start selling or finding a product that you already have enough information – that’s your choice. But, for starters – don’t jump into the glittering band-wagon unless you know there’s a room booked in for you. Make your stand within a niche and grow – Don’t try to market or sell products of different categories, your learning journey will be stressful and you’ll face a difficult time even conducting your marketing activities. Don’t go for the higher pricing, and stick with the profit margin of $10-$25 while you are starting. You want to minimize the financial risk caused by damaged products during shipping. Even more, you want to avoid the returns due to delayed delivery of products. Select the products based on the demands, or even better, select those products which are demanded by the customer group within your reach. Knowing the target customers is crucial but being connected to them already is a huge potential for growth. For eg: If you sold pregnancy pillows to customers before, now select baby care items or post pregnancy products next. Final but the most important tip for product selection: Make sure that you list and sell products from the verified shipping suppliers. Even if you find the best list of products to sell on your dropshipping site, you need to find a verified supplier listed on one of the popular dropshipping product sourcing platforms. You can never stop hunting for products to dropship. Price is definitely one thing that will grow when the demand for a specific product increases and with that, the profit margin falls down. So, keep on a lookout for a verified supplier who has the potential to fulfill your orders in cheaper rates. Gradually after improving your products marketing, advertisement costs and after building a successful relation with the suppliers and creating a pool of satisfied customers, start searching for and launch your products with the higher profit margin. How to conduct effective marketing for your dropshipping business? You could implement the popular internet marketing tricks like SEO, email marketing, running paid ads on Google and Facebook or similar techniques. All of them have their merits and demerits and these are also the general marketing tricks. What will you do to actually sell your products? All the other techniques of internet marketing will help you get the visitors to your site except affiliate marketing and marketplace listings. Let’s be honest here. These two are the only way that help you send your products to the customers where they are actually willing to buy from you. Requirements to run a bulk products affiliate marketing campaign to grow dropshipping are fairly simple. You need to register a merchant account on Shareasale, Webgains, Avantlin or similar platform. Send the list of your selected products and the required information to those platforms in the required format. You can use ExportFeed to create product feeds for affiliate platforms. Now, set up an affiliate campaign with cookie tracking policy, commission structure and others. Finally, recruit the affiliates who are willing to promote your products and educate them and provide the required materials for promotion. They will send the customers to your site and you will send the orders from those customers to the suppliers. One point where you’ll need to pay special attention is again the calculations of your profit margin. Since, you will be spending on advertisement, and you will need to keep your profit margin secure while paying out the commissions to the affiliates, you may only be able to pursue the promotion of dropshipping business through affiliate marketing for high value or highly trending products. Making your products available in different marketplaces will increase the exposure for your products. But not just that, you will also benefit from the marketing efforts of those merchant. Some of the most popular marketplaces to sell your dropshipping products will be Amazon, Google Shopping, Facebook and others. But depending upon the product niche that you will be dealing with, you can select specific marketplaces too. Like if you are selling electronic products, you can choose to list under Newegg. Furthermore, if you are selling handmade products you can list them on Etsy or Bonanza. An eCommerce shop populated with your dropshipping products. A seller account on a marketplace that provides product feed format. ExportFeed installed in your eCommerce shop to create product feed. Google Shopping: Google accounts for over 63000 search queries per second as on 2018 data. People are habituated to searching for products title on Google as well for which Google returns the products listed on Google Shopping. This is one alternative to SEO which takes long time. Listing your products on Google Shopping will send the qualified visitors to your site who are more likely to make a purchase than those visitors which you receive through the organic SEO practices. Amazon Marketplaces: Success of dropshipping is highly dependent upon the location of your supplier. Amazon presents an amazing opportunity to target your customers of North American, European and Asia pacific regions. When you list your dropshipping products on Amazon (North American & European) marketplaces, ExportFeed will sync the orders and help you manage the inventories. Facebook: But Facebook is a social media, right? Yes and so it presents the opportunity to let you participate in the social commerce. The best tip for conversion optimization of your eCommerce is create trust. And, when you list your products through Facebook, trust factor is something that you don’t have to muster from other platforms. Automate the process. 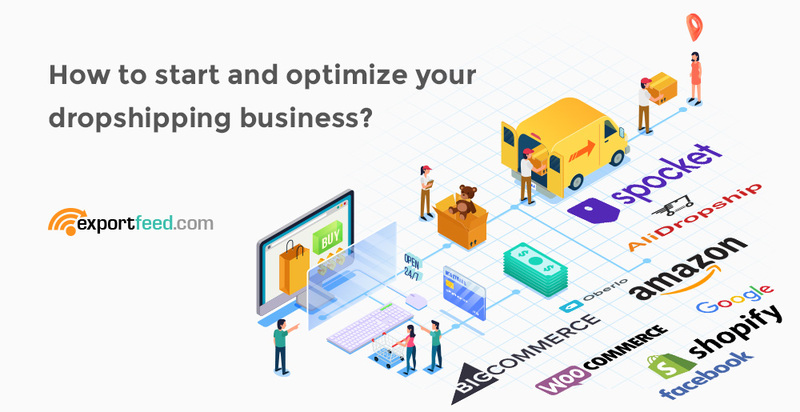 If you are using Shopify or WooCommerce to power your eCommerce platform; using Spocket to as your dropshipping product sourcing engine, and ExportFeed to list your products on the merchant sites the technical aspects of your dropshipping business are automated to the maximum limit. If you are willing to optimize your eCommerce marketing or dropshipping business by listing products on the high selling merchant sites, you can start with the free trial of ExportFeed services from here.